Wright-Patterson AFB, also known as Wright-Patt, is the result of the merging of Wilbur Wright Field and Fairfield Aviation General Supply Depot. Located near Dayton, Ohio, it is the largest and most organizationally diverse base of the USAF. The host unit is the 88th Air Base Wing which maintains the airfield and support operations. 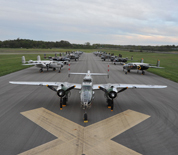 Over 60 additional units call Wright-Patterson home. Wright-Patterson is headquarters for the Air Force Materiel Command, home to the National Museum of the United States Air Force and the host of the annual USAF Marathon. This Wright-Patterson AFB directory features the critical info you’ll need to navigate through the many facilities and recreational opportunities available on base. Barber Shop - Base Command Bldg. Wright-Patt Credit Union - Base Command Bldg.